This was our first return to the site in over twelve months. Our purpose was to see if we could find evidence for this structure, which Derek Winstanley described as the earliest viaduct in the world to have carried a steam locomotive. If this is true, it would be a very significant find indeed. Derek had said at our meeting in September that the masonry viaduct (know locally as the Arches) was built by John Clarke in 1792. Clarke, a local mine owner, want to expand mining operations onto the Winstanley Estate. For many years in the 18th century, wooden wagonways had been used to transport coal via horse-drawn wagons down to the River Douglas; first to the Douglas Navigation in the 1770s and then from 1784 to the Leeds and Liverpool Canal. One had reached as far as Ormskirk Road at Oldham's Fold in Pemberton to exploit the Orrell coalfield. Clarke and his Liverpool partners, however, had leased land from William Bankes of Winstanley Hall. They realised that to get the coal from this area to the canal they would have to extend this wagonway south of the Smithy Brook. The only way to do this was to build a viaduct across the Pingot Valley. It still needed a team of horses, however, to haul the wagons up the incline to Ormskirk Road. By the early 1800's, the Napolionic War was in full swing and horses and fodder became more expensive. Clarke was finding it difficult to justify the cost and thought at first to have a static engine built to winch the wagons up. However, having spoken to his colliery manager, Robert Daglish, he changed his mind. Daglish had built static engines at the Haigh Foundry for Lord Lindsey's mines on the Haigh estate and, in 1812, persuaded Clarke to send him to Middleton to have a look at Blenkinsop's new-fangled locomotive, which, , had run successfully on colliery lines in the area. The result was that by 1813 Daglish had his own, much bigger machine (6.5 tons - 1.5 tons heavier than Blenkinsop's). The wagonway was upgraded with cast iron 'fish-belly' rails mounted on stone blocks and a rack down one side to engage the locomotive's driving pinion. It was successful and Clarke commissioned 2 more, running them continuously for 4 decades. According to his research, Derek cannot find an earlier example of a steam engine crossing a stone-built viaduct. 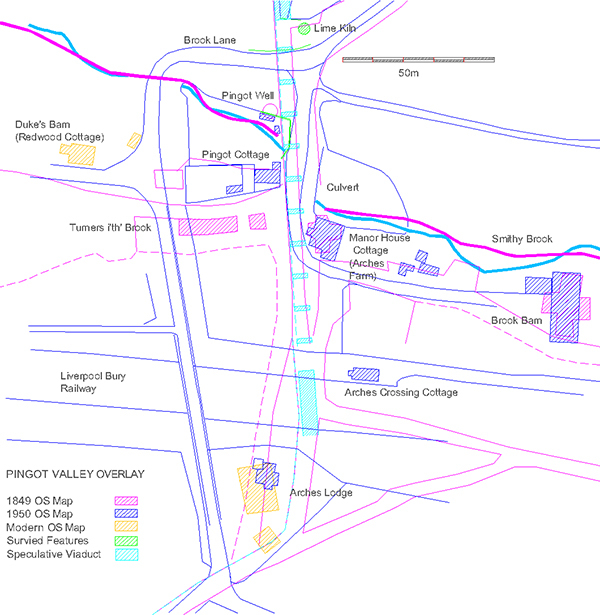 Early maps show that viaduct was still in existence when the Liverpool Bury railway line was built in 1848 (a later edition of the 6 inch OS map has the viaduct crossing this line at it southern end). Studying later maps we also discovered that a small community lived in the Pingot Valley for many years, up until the 1950's when the last buildings were demolished. Our last site visit enabled us to complete a plane table survey of the features still visible (see Newsletter 164). From this we've been able to create a detailed drawing combined with maps from the various periods. Our only image of the viaduct is this sketch looking south east. From it we've been able to speculate where its piers would have been located. With this information last month we ventured into the undergrowth. We began by looking at the north embankment near to where the lime kiln is located. Probing indicated that there was stonework just below the surface. However, scraping away the turf in a couple of areas, suggested that this was just loose stones (a gate on the embankment suggested a track had been built here to access the field beyond). 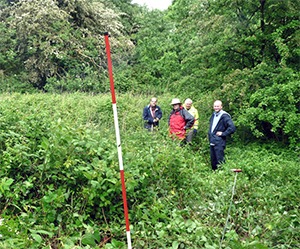 We then decided to look at the southern section making our way through dense vegetation. Conditions were difficult (Indiana Jones springs to mind) but we did manage to get a tape across from the present day bridge to relevant area. There was no obvious stonework and probing produced nothing significant. It was felt the testpitting would be the only option but this would require permission before proceeding. Before we left the site we were able to have another look at the area around the brook and the Pingot Well. The culvert doglegs south for some reason coming out near to where the Manor Farm was. Could there once have been a mill here? It was decided that this area had potential for further study. Wednesday 4th June - For a change this month we are having a guided tour of St Wilfred's Church in Standish. Joe Bazeley, the Church treasurer, has agreed to take us around this grade one list building (the only one in the Wigan Borough). It was built in the 16th century and replaces earlier churches built on the same spot. It is inextricably linked to the Standish family who built chantries on the site and supplied many of the church's rectors. We will be meeting at the usual time 7.30pm but not at our usual venue.- our meeting point will be St Wilfred's Church in Standish. Hope to see you there. At our committee meeting various ideas were suggested but nothing was decided. However, at the GM Federation meeting last month, Norman Redhead announced that the Friends of Casstleshaw Roman Fort had obtained a lottery grant and are planning to excavate this summer in late July. This would make a great trip out, especially if Norman can give us a guided tour of the site. We could include another site in the area, perhaps the Roman Road at Blackstone Edge or if we are more adventurous, Sandal Castle near Wakefield. It would mean a trip date in late July instead of our August. Please let me know what you think - BA.